Think Charlotte’s Web when you read the sentence: My new pig is here! 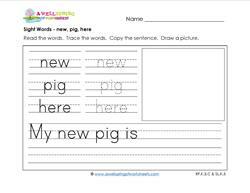 Trace the sight words – new, pig, here. Write the sentence. Draw a picture.